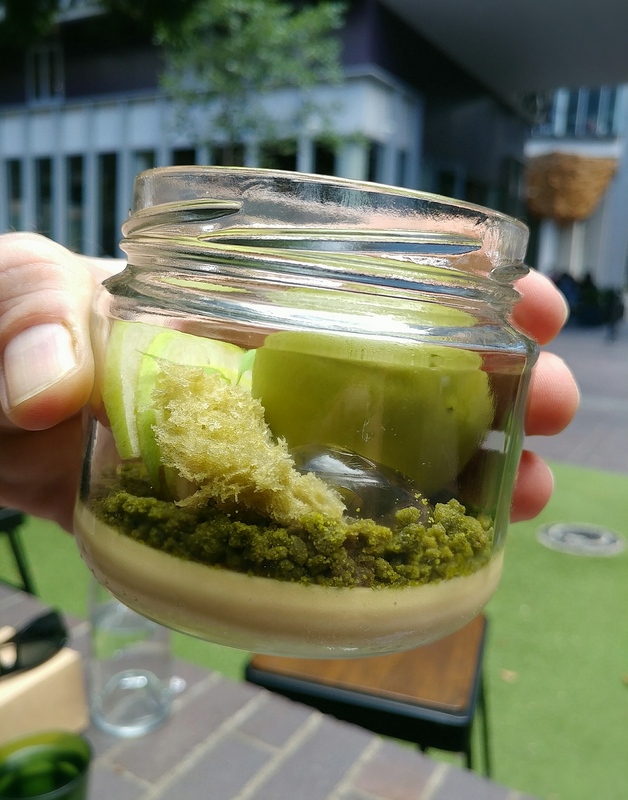 A friend suggested Little Valley in Fortitude Valley for a dining destination, and though we had been out of the loop enough to not have heard much about it, we made our way there on a weekday lunchtime when a group of us happened to be free. The outside of Little Valley. There is a sign. 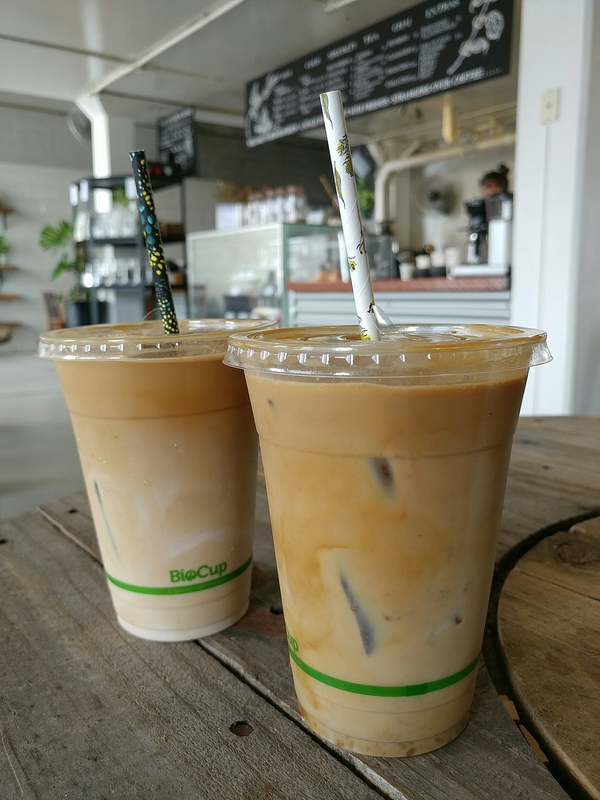 Located on Warner Street, it is just across from the McWhirter’s building. 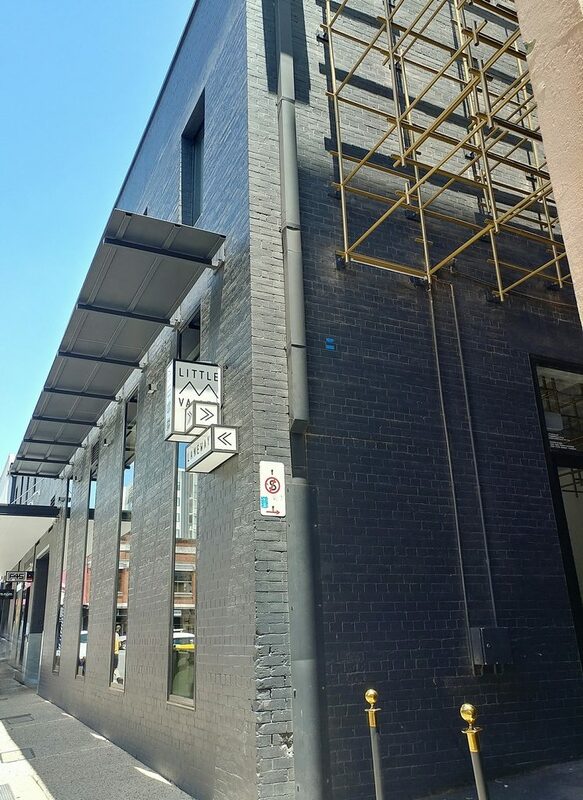 The exterior of the black brick building doesn’t give much away, unless you know what you are looking for, and in Melbournian style, the entrance is through an alleyway. One door, but the one you are after is further up the alley. 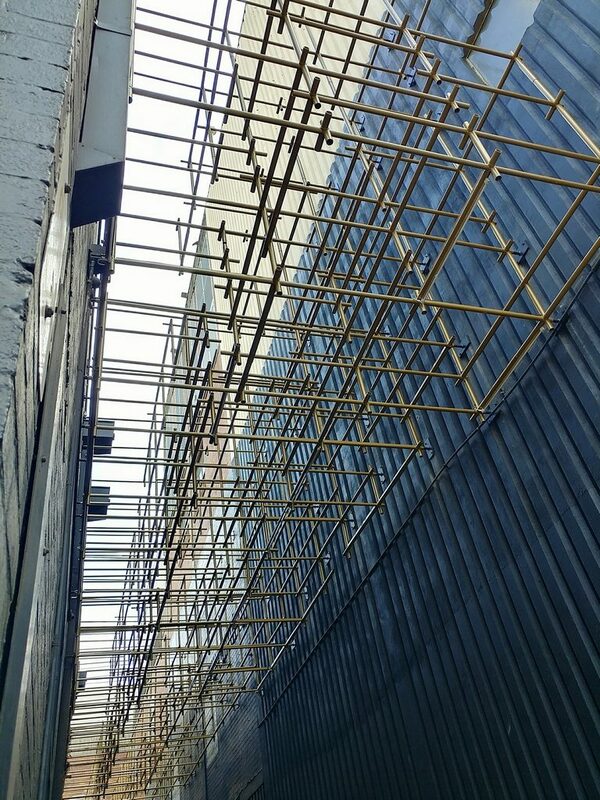 It is not quite an ordinary alleyway though, the space above it filled with a grid of gold coloured rods, making you feel like you are in an art installation, or a futuristic movie set. Making your way to the entrance, you find yourself in a surprisingly large space. 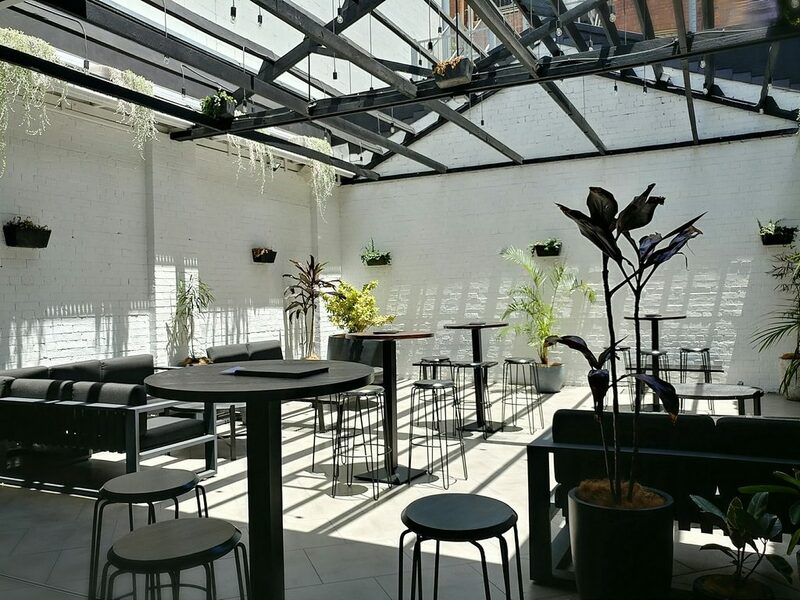 There is an area set up on one side with bar height tables and stools, with daylight streaming through open rafters, brightness enhanced by the white walls. On the other side is the more eatery-style area, a mezzanine level down. That is a beautifully set up space, with high ceilings and parquet wooden floors. 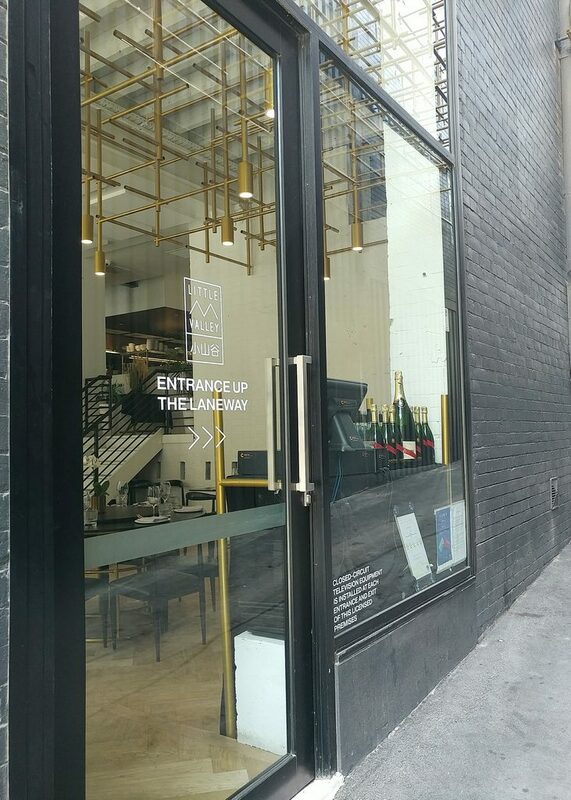 The gold grid in the alleyway is echoed here in the light fixtures and shelving. 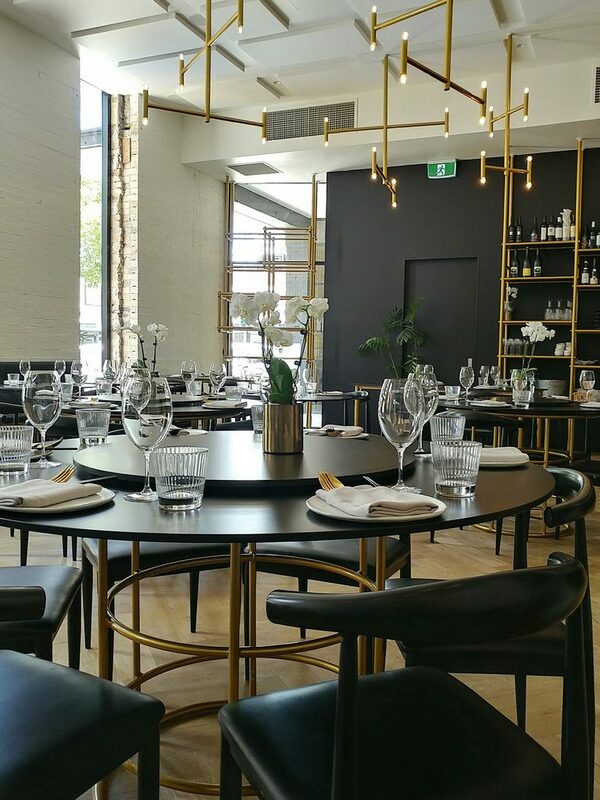 The colour scheme of black, white, and gold, and the styling (Hans Wegner elbow chairs with their graceful curves) give it a Great Gatsby era feel. It feels sophisticated and luxurious, without being overdone. Relaxed house music played in the background, at an audible but not intrusive volume. The powerful air conditioning gave a much appreciated reprieve from the heat outside. Incense sticks stuck in the plant pots slowly released a subtle earthy fragrance. 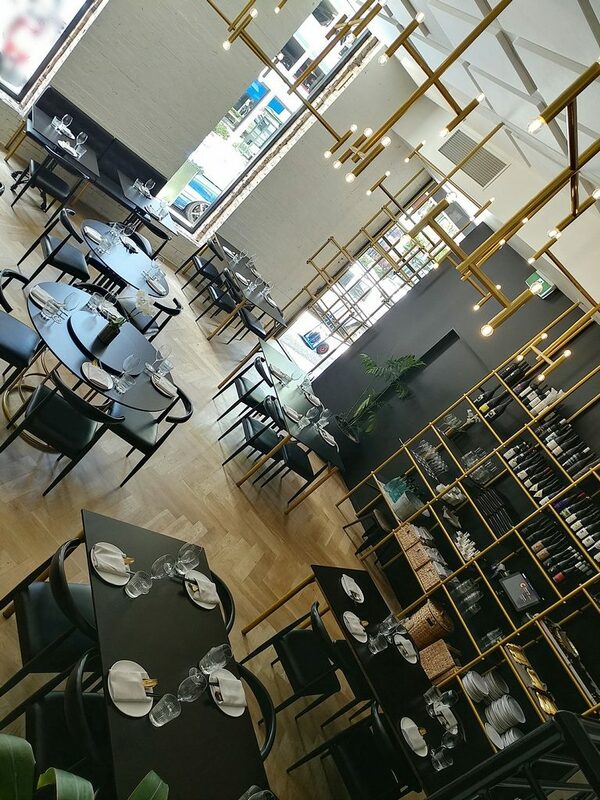 Another view of the restaurant interior and the table settings. Having the turntables made it easier to share food. 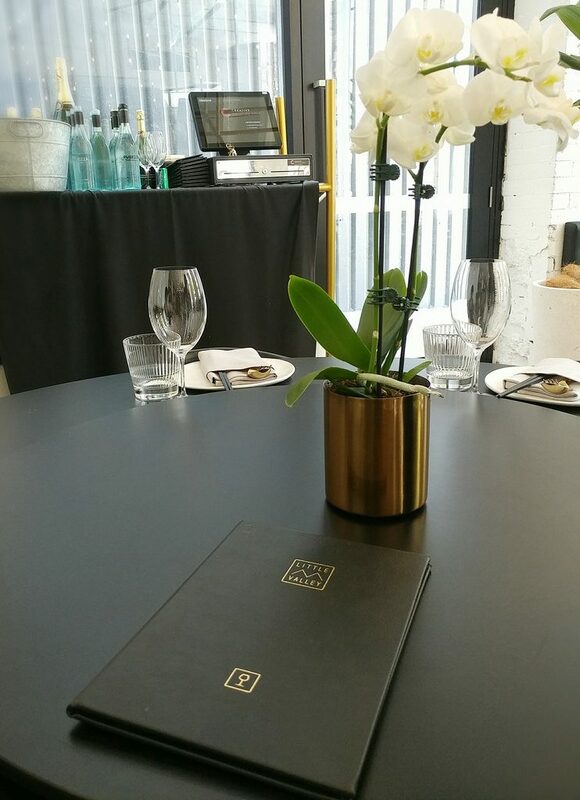 We were offered the choice of sparkling or still water (both chilled), and drink menus were placed on the table. There were many pages of alcoholic options in the drink menu, as one might expect from a fashionable dining venue in the Valley. 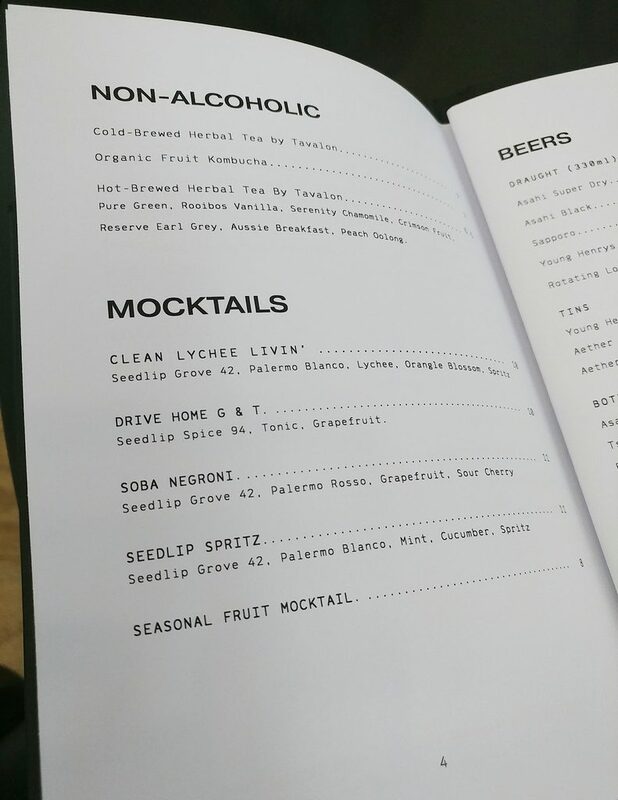 What we did appreciate though, was the page of non-alcoholic options, that included a list of mocktails that looked like they were more than overpriced fruit juice blends (which, sadly, mocktails often are). The drink menu and white orchids at the table, matching the rest of the decor. The selection of non-alcoholic drinks. After we had decided on drink orders and placed them, we were brought food menus. This, too, was a book of many pages. The waitstaff explained the various sections of the menu to us, and brought out a further leaflet which listed their Yum Cha Lunch selection (a set menu only available at Thursday and Friday lunchtimes). The Yum Cha menu to consider. Bemused by the many options, we ended up selecting the Feed Me menu. They have a $55 per person option, and a slightly longer $75 option. Not feeling overly ravenous, we chose the $55 option. Before leaving the table, the waitstaff asked if we had anywhere to be by a particular time, or if we had time for a leisurely lunch. That was a thoughtful thing to establish, as they could then adjust the pace of the dishes. The options we finally narrowed it down to. One of the mocktails we ordered was the Clean Lychee Livin’. It was listed in the menu as having Seedlip Grove 42, Palermo Blanco, lychee, orange blossom, and spritz. 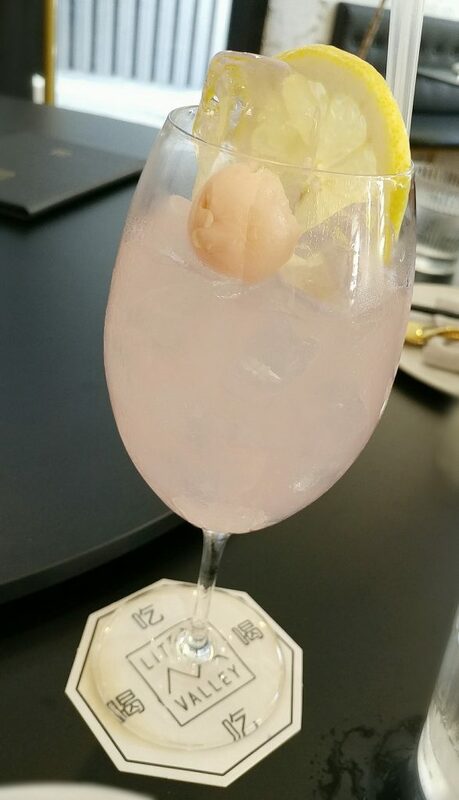 It was prettily presented, the liquid a light dusty pink in a wine glass, garnished with a lychee and a slice of lemon. Seedlip has created alcohol-free spirits, so one can still get complex flavours in a drink without it having to be something alcoholic. The mocktail had citrus notes, without being sour, and had a lychee aroma. 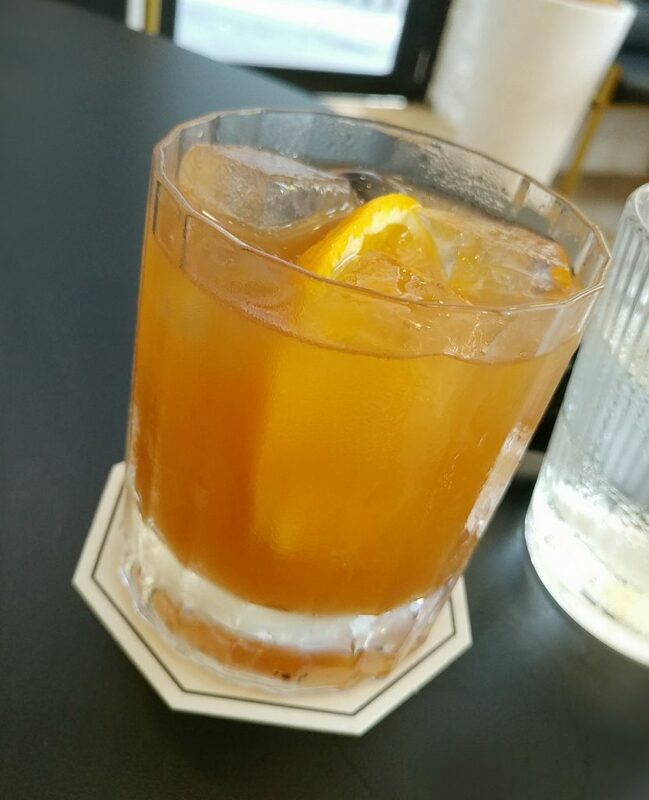 It was not actually sweet overall, and was certainly a grown-up’s drink. The Clean Lychee Livin’ mocktail. The other mocktail we ordered was the Soda Negroni. This also had Seedlip Grove 42, as well as Palermo Rosso, grapefruit, and sour cherry. Palermo Rosso (as well as the Blanco) is another non-alcoholic mixer made with aromatic herbs. This was served like a Negroni cocktail, with similar colouring and glass presentation. The tasting notes were citrus, with a lightly herbal bitterness that was not overpowering. 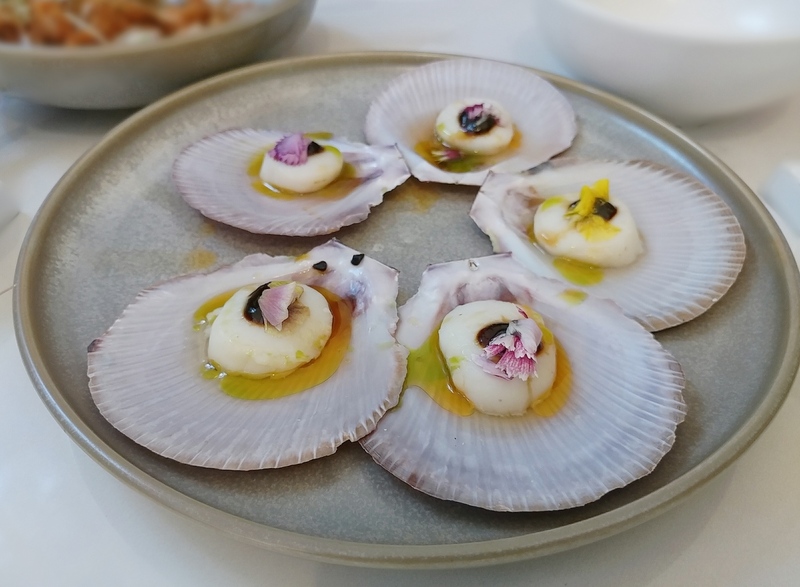 The first food item to be brought to the table was Cured scallop, spiced pumpkin seed, and chilli oil. 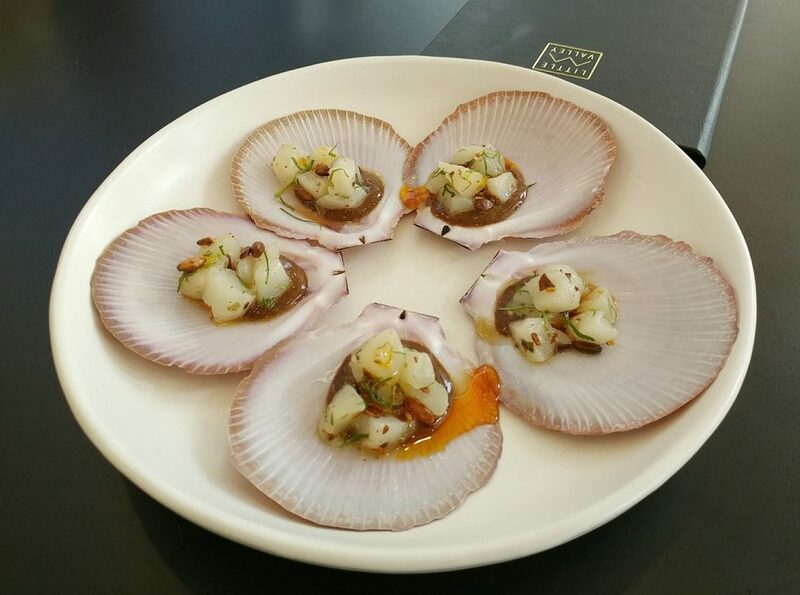 The scallops were cut into small pieces that increase their exposure to the cure, but still meant that you could still appreciate the tender scallop texture. The spiced pumpkin seed mix was a nutty sauce that was savoury and had moreish umami flavours. It was a little spicy from the chilli oil, but just enough that you had heat without it drowning out the scallop. It was a tasty and promising start. The Cured scallop with spiced pumpkin seed and chilli oil. 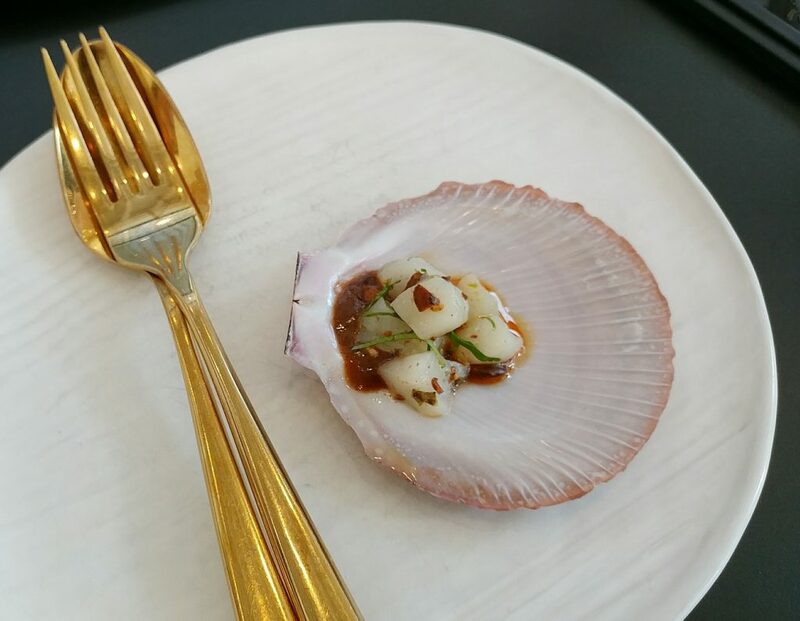 One scallop serve per person.. The next couple of items were brought out together. 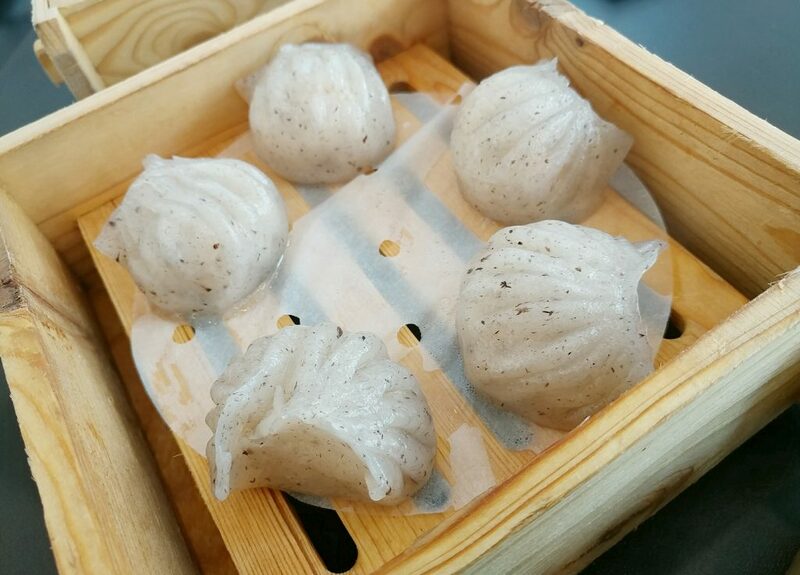 The Truffle and prawn har gow were neatly laid out in a circle on a paper liner in a steamer tray. 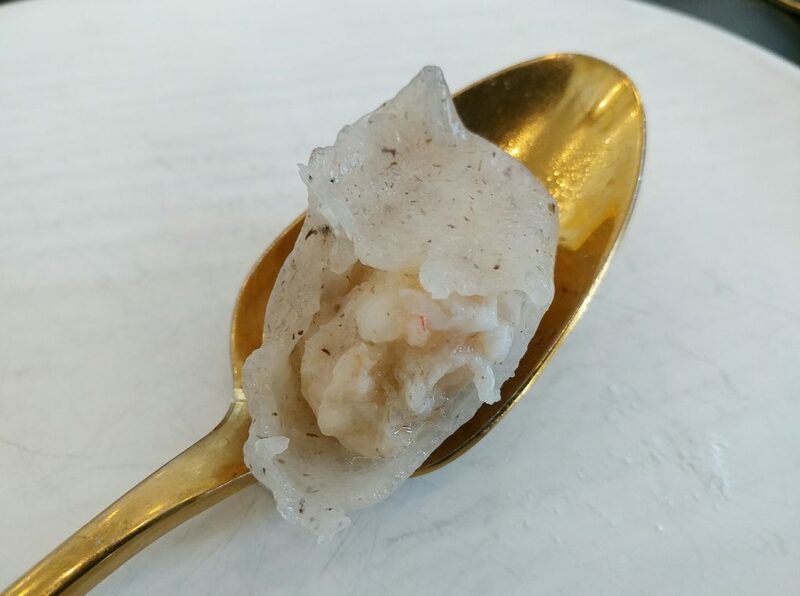 The translucent har gow skins were dotted with finely chopped truffle bits. Biting into them, we found the skins to be supple and not too thick. There was a definite truffle aroma, that went well with the juicy prawn pieces inside. The Truffle and prawn har gaos. A closer look at one of the dumplings. 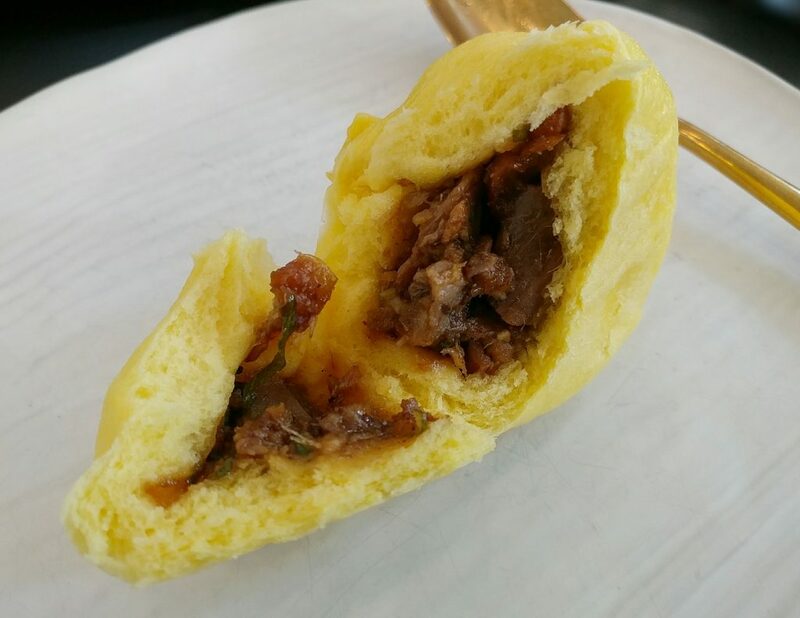 And a look at the filling inside one of the har gao. The Duck a l’orange steamed buns were served in round steamer baskets, as you would get if you went to a dim sum restaurant. 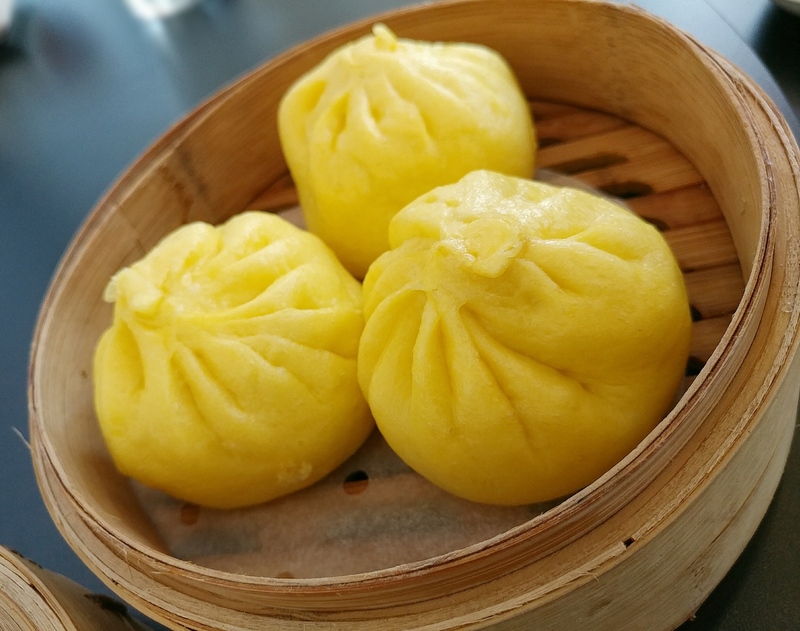 Different from the normal steamed bao, they were a sunshine yellow colour. 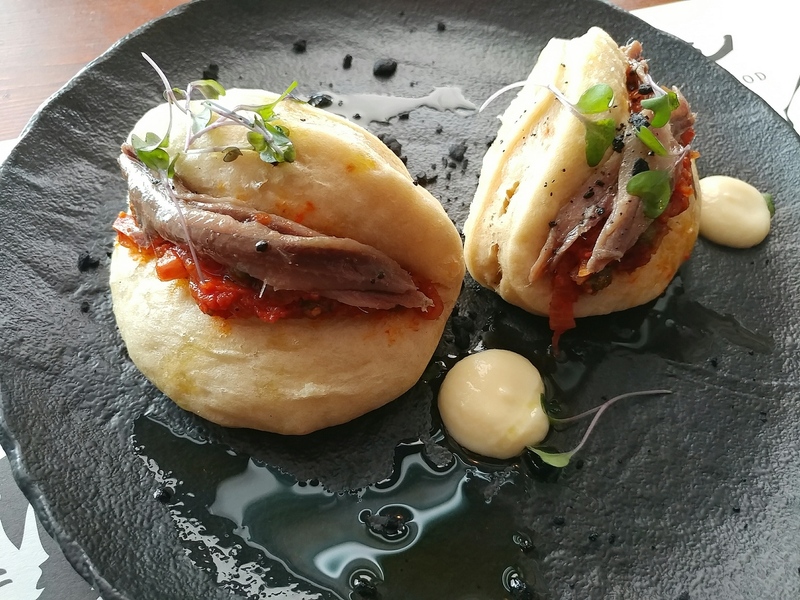 The buns were appropriately fluffy, and on the inside were tender duck meat pieces in a savoury and sweet sauce with distinct orange notes. The meat to sauce ratio was good, so that the meat was well coated without it being a sloppy mix. The Duck a l’orange steamed buns. Inside one of the buns. They tasted better than this looks. We were then presented with a palate cleanser. In small cups with jewelled designs were scoops of a Jasmine tea granita. It had a fine grain, and had a refreshing, citrussy flavour. It did indeed cleanse the palate in preparation for the following dishes. 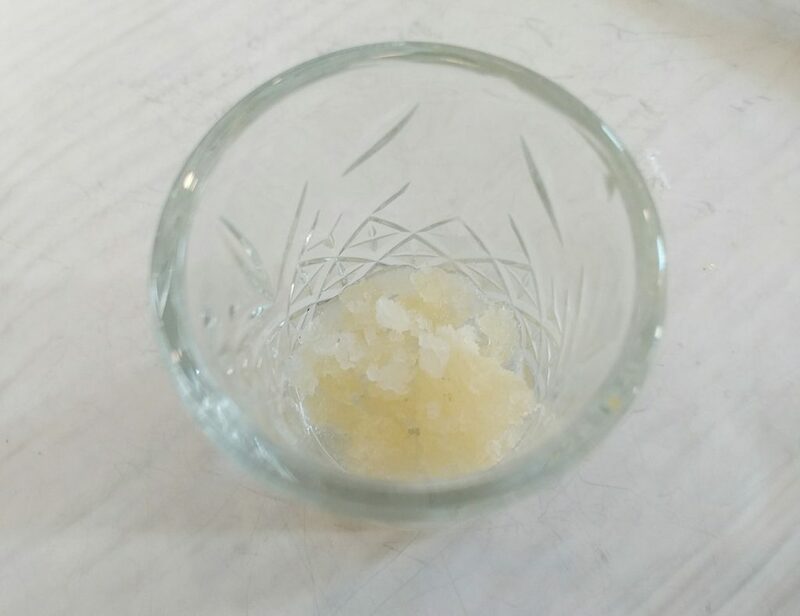 A closer look at the granita. 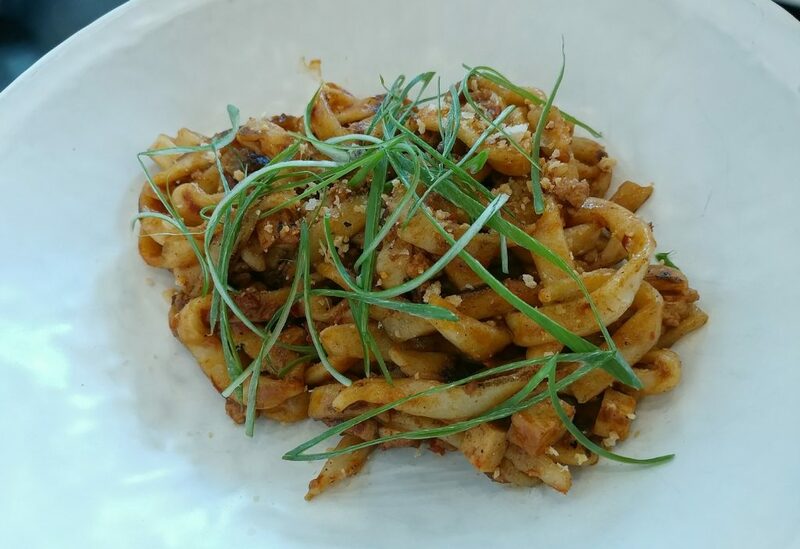 The next item was described in the menu as Chinese bolognese, with Nduja XO sauce and prawn floss. That was an interesting description of it, as there are certainly many varieties of Chinese minced pork (or other meat) noodles, and one doesn’t have to call it a bolognese to get people to understand what it is. The noodles were served in a couple of large bowls for us to portion out amongst ourselves. The shared dining style is common in Chinese restaurants, and the portion size was appropriate, so everyone had a good amount. 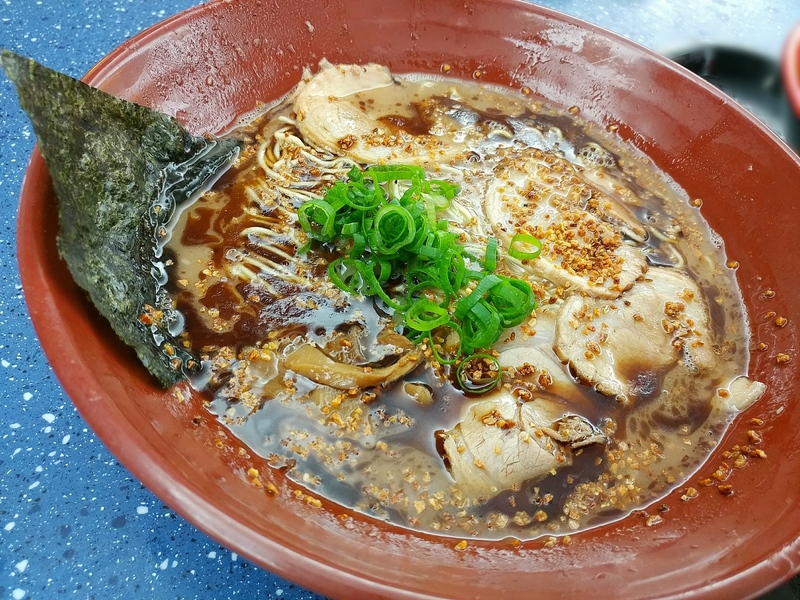 The noodles were thick, so not at all like spaghetti, and they had a springy, chewy texture. If you know of KL style rat’s tail noodles, they are reminiscent of those. 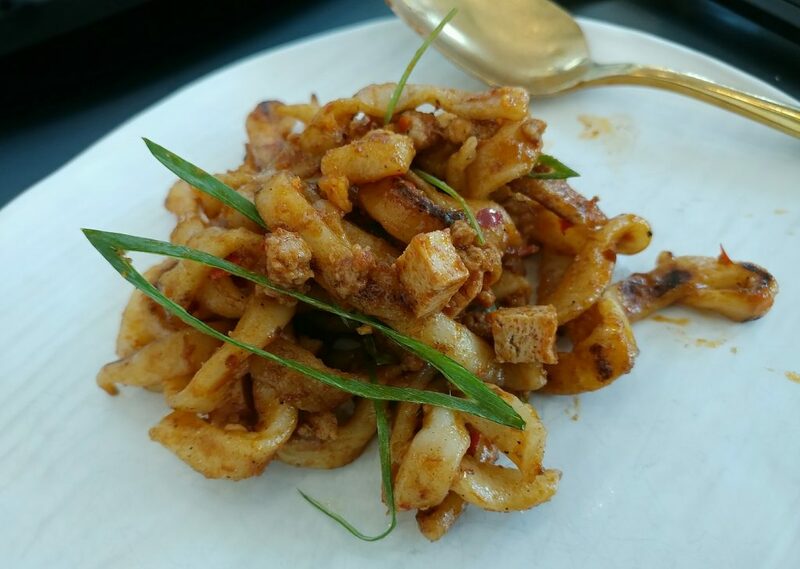 The Nduja XO sauce was savoury and spicy, and coated the noodles well. There were also bits of minced pork and small fried tofu cubes in the mix, for a different texture. The prawn floss gave it a little sweetness. 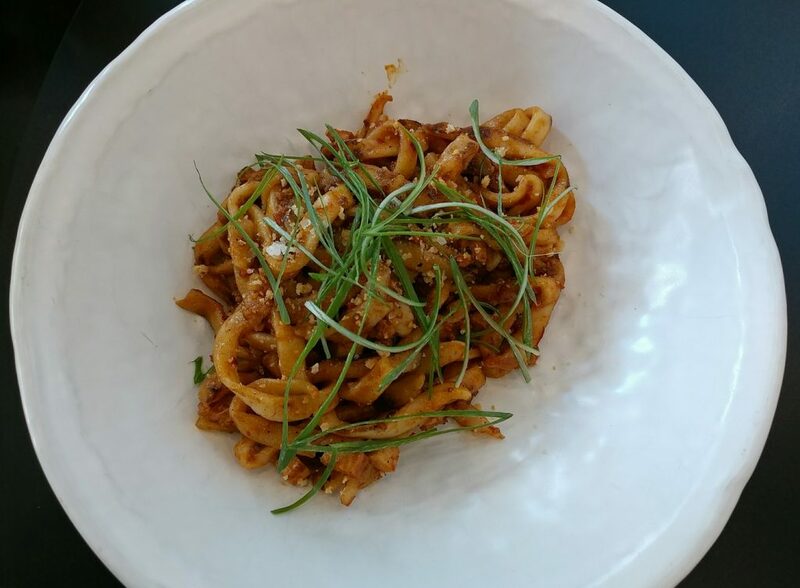 The Chinese bolognese, with Nduja XO sauce and prawn floss. The noodle dish closer up. Taking a portion of the noodles out. You can see the tofu and minced pork better. When we were done with the noodles, the next two dishes were brought out together, accompanied by sharing bowls of Jasmine rice. 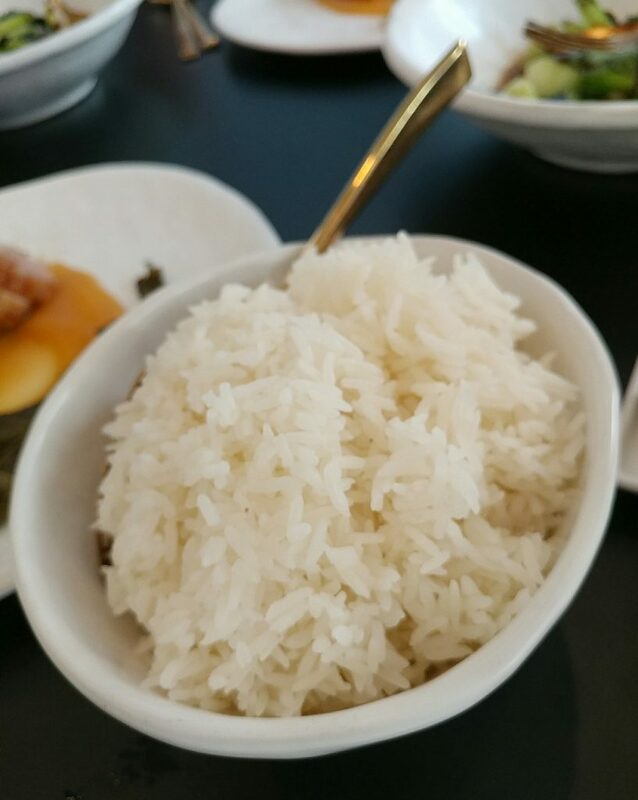 The bowl of jasmine rice to share (there were two bowls for the table). As the plates of Baby asian greens, with ginger and garlic, and house oyster sauce were placed on the table, staff told us that they made the house oyster sauce with six dozen oysters per litre. When you work out that that is 72 oysters per litre of oyster sauce, you realise that it is going to be better stuff than what you get off the shelf, which is often mostly sugar, salt, and starch thickener. 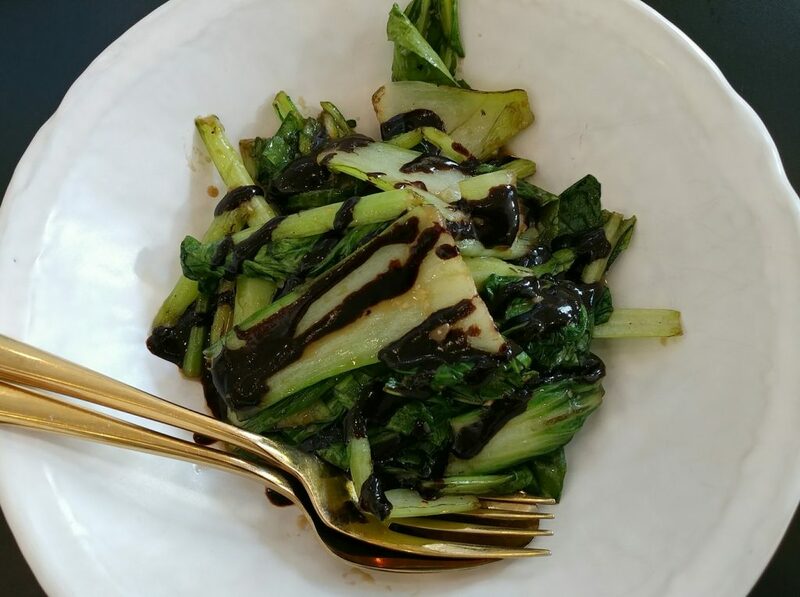 The greens were just cooked, so they retained a fresh texture, and the oyster sauce drizzled over them was savoury, sweet, and had a delicious richness. The asian greens with ginger and garlic, and house oyster sauce. 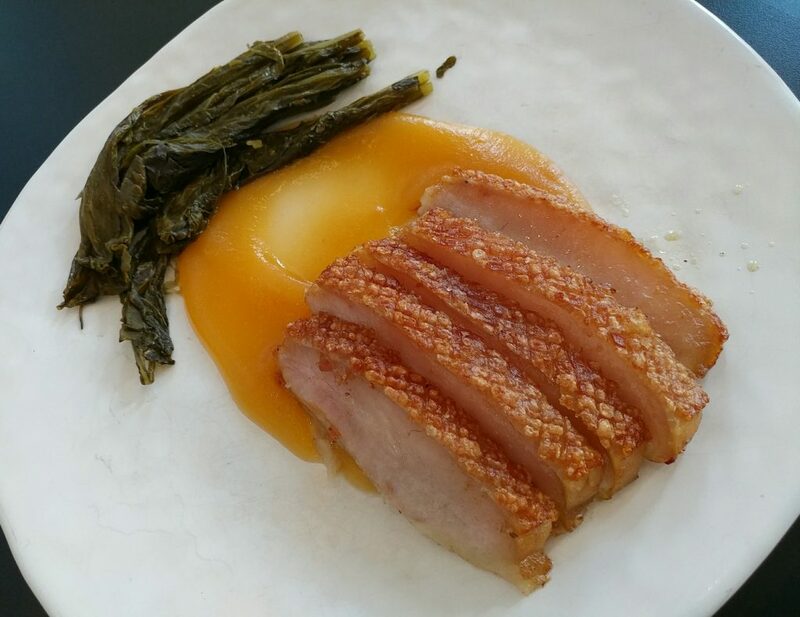 The Pork cheek, mustard greens, and apple sweet and sour was a take on a more typically western combination of pork and apple sauce. The skin on the pork pieces had a solid crunch. There was a jelly-like fat layer beneath that, and soft meat. The pork was a touch salty, likely because of the salt needed to get that crunchy skin. It was alright when had with the rice though. The Pork cheek with mustard greens and apple sweet and sour. Another look at the pork. 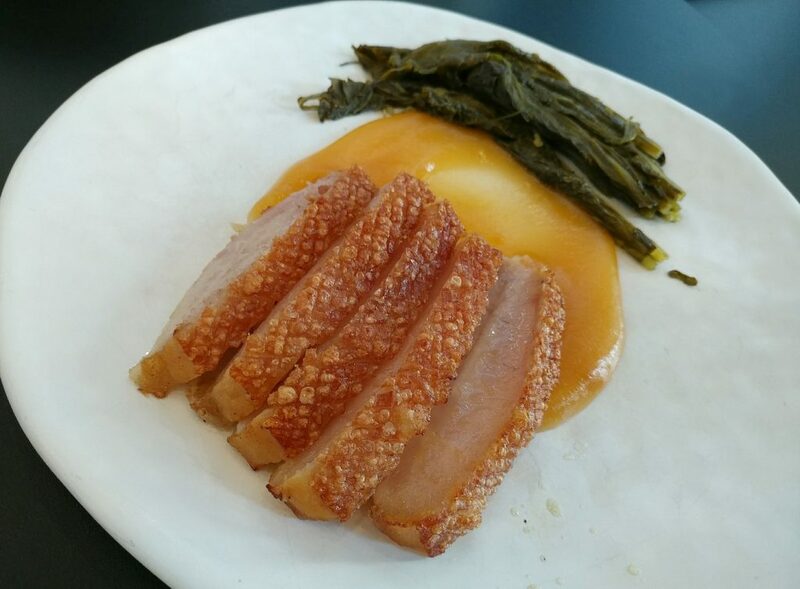 You can probably see how crunchy the pork skin is. 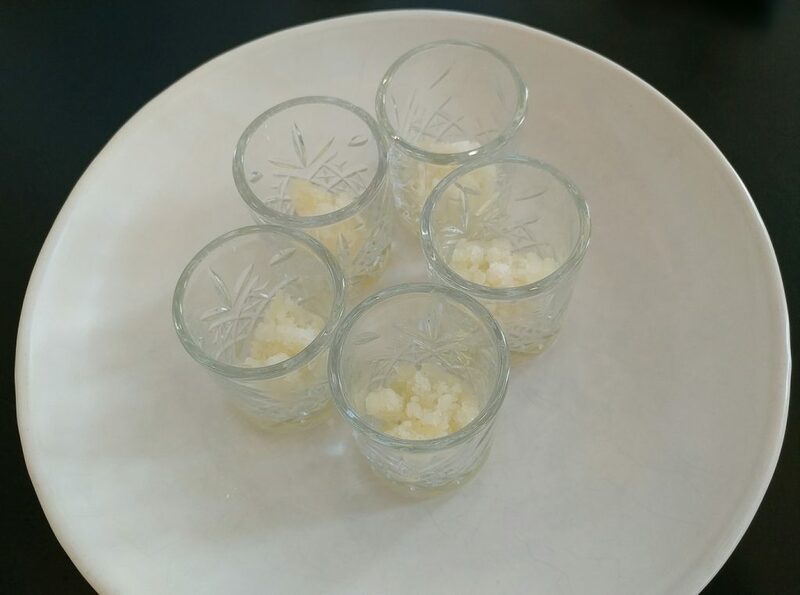 Before the last course, the wait staff surprised us with small glasses of their house-infused baijiu. Given the alcohol content of baijiu (42 to 53%), the only appropriate serving size would be a small serve.. They had brought out smoked honey-infused baijiu. They also do lychee and rosewater, and lemon myrtle versions. It was certainly fragrant. 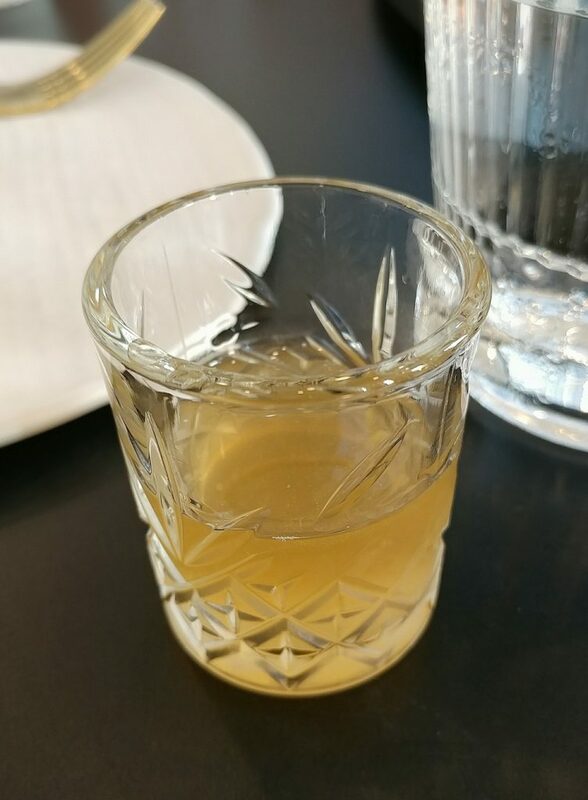 A sampleof the smoked honey-infused baijiu. The final, dessert dish, was Salted duck egg steamed buns. Served in steamer baskets as the dishes right at the beginning had been, it was a nice circular closing, whether they had intended it to be that way or not. The seed-studded buns were piping hot. 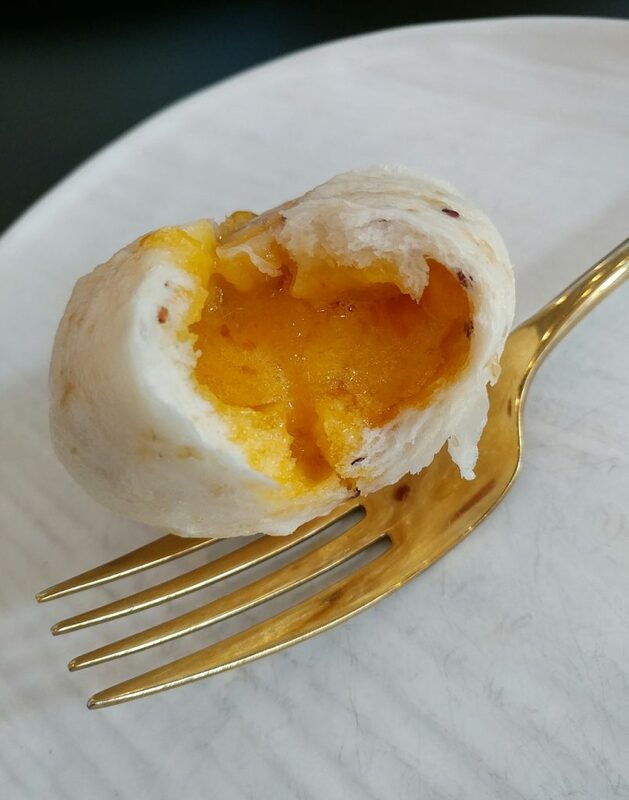 It did take a little skill to eat them, as, as one hopes from a well done liu sha bao, they were filled with a runny salted egg custard that flowed like molten lava once the bun was split or bitten into. It was a good blend of the distinctly savoury yolk flavour, and sweetness (it was a dessert, after all). 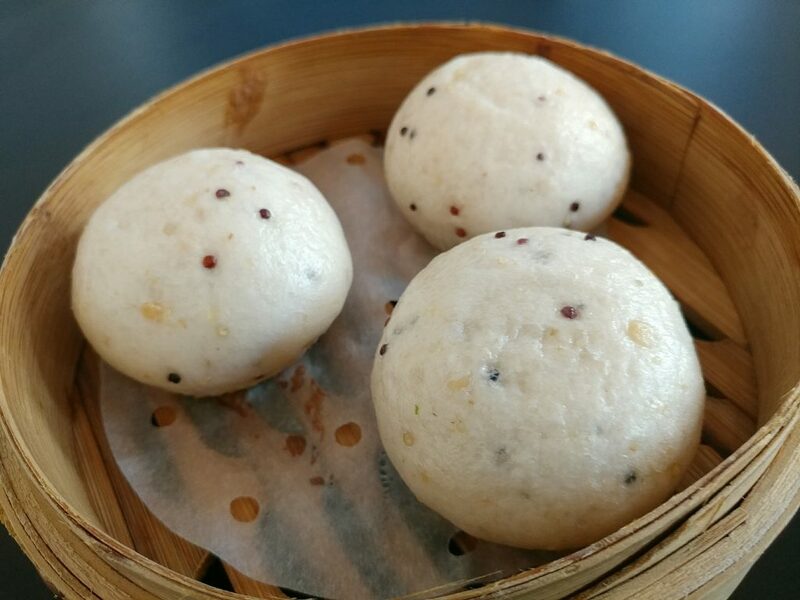 The Salted duck egg steamed buns. 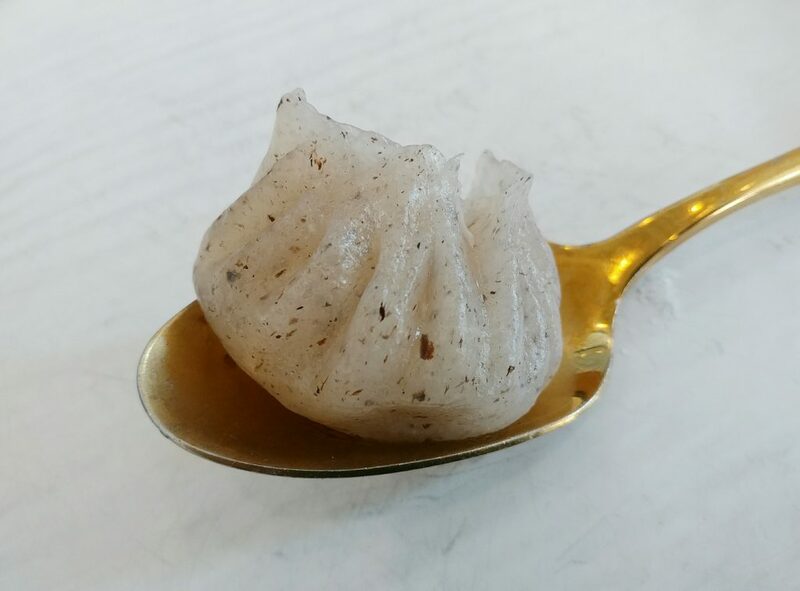 The runny filling inside the steamed bun. Overall, we found the food at Little Valley very well done. We enjoyed each dish, and there was clearly attention to detail in the preparation of each item. The Feed Me menu had good portion sizes, and we were well-sated at the end of the meal without feeling like we had been absolute pigs (although it might have been different if we had had the $75 menu). The food was a clever combination of flavours that were a modern twist on more typical chinese dishes, but also got the techniques right. We felt well looked-after by the waitstaff, who were professional and slick, but also cheerful and friendly. They well-informed about the food. They explained each dish as it was brought out, and were able to answer questions we had about it. 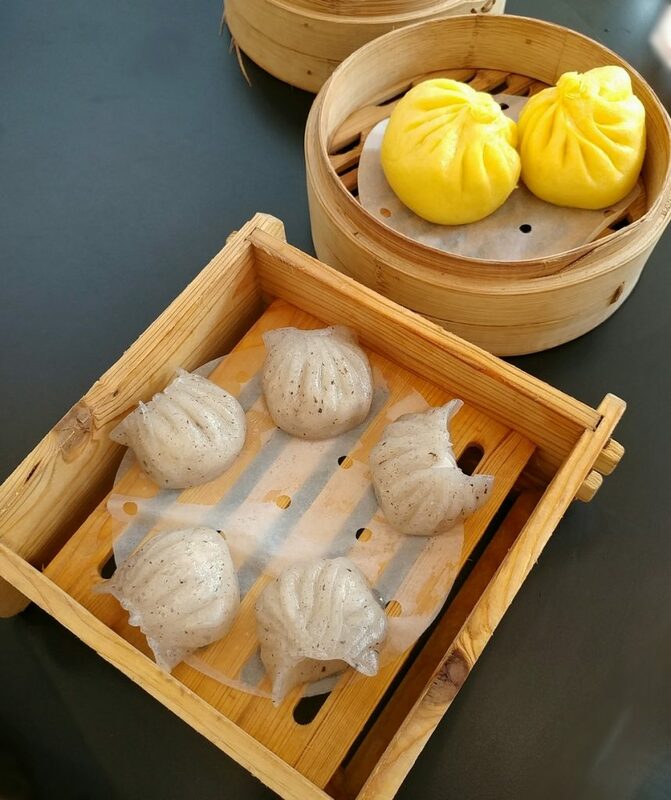 There was also attention to little things to make sure that we had a good dining experience, like taking the buns to put back on the steamer when a couple of our dining party had to duck out to move their cars, so that everyone could enjoy them hot. 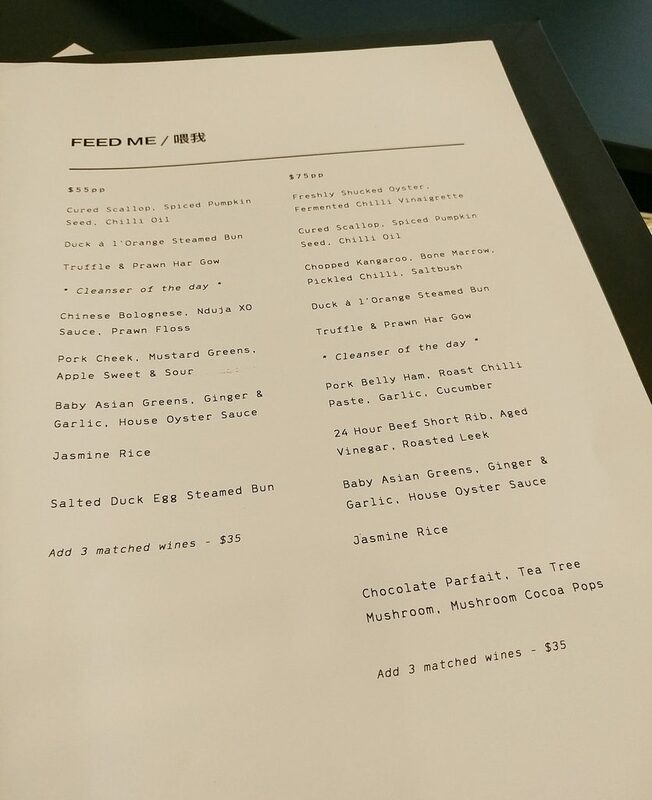 Another look at the steamed items, which you would also get on the Yum Cha menu. 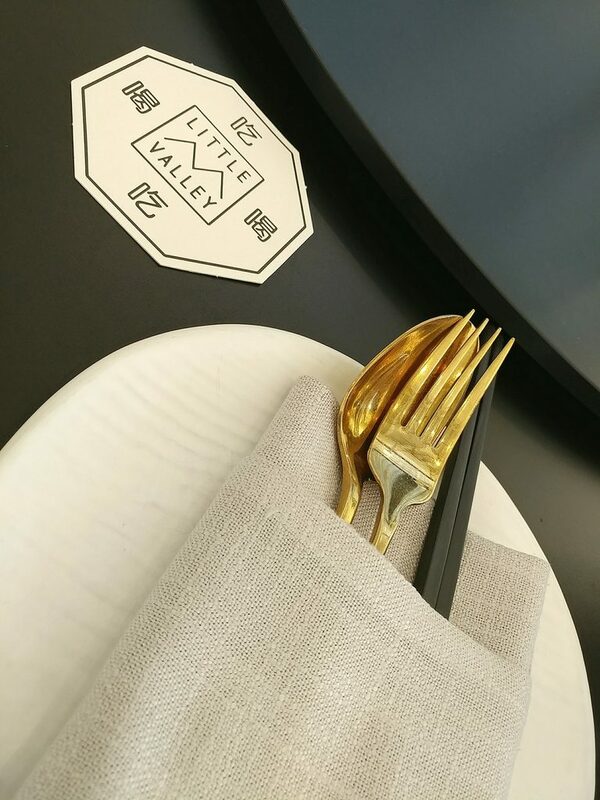 We would definitely recommend Little Valley as a dining destination, and would suggest leaving some time to enjoy the spread on the Feed Me menu. Price point: Feed me menu as described $55 per person. Longer menu also available for $75 per person. 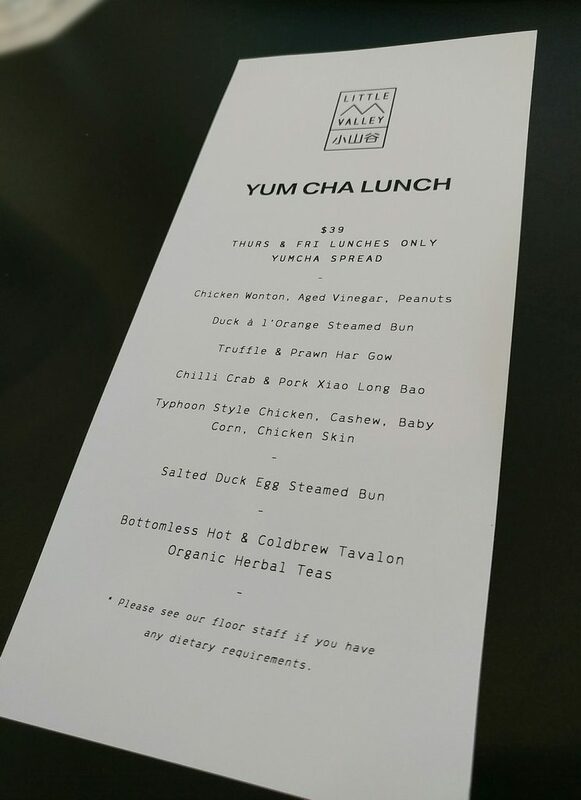 The Yum Cha lunch menu is $39 per person.